This is Dr. Maysa Akbar’s story. A story of overcoming Urban Trauma. Yet there are those in urban communities who continue to be plagued by what Dr. Maysa Akbar has defined as Urban Trauma – a set of conditions that sustain modern day oppression. 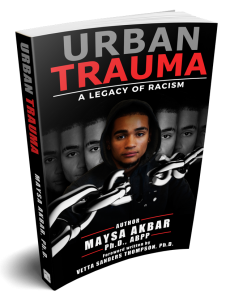 In Urban Trauma: A Legacy of Racism, Dr. Akbar makes the case that since the time of slavery, systemic trauma in our urban centers is a result of poverty, overcrowded housing, poor physical and mental health, despair, violence, crime, and drug abuse. Drawing from historical events, intergenerational biology, and psychology she expertly illustrates that not only is Urban Trauma real, but that by denying it’s existence we deny our communities of color the chance to heal and break their cycle. Check out Maysa’s book on Amazon today. Also, check out our Facebook Live Author Interview with Dr. Maysa Akbar! 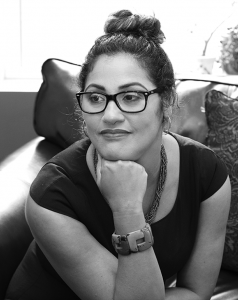 Maysa Akbar, PhD, ABPP, author of Urban Trauma: A Legacy of Racism, is the Founder and CEO of Integrated Wellness Group, a multidisciplinary psychotherapy practice in New Haven which focuses on at-risk urban children, adults, and families. In addition to her private practice, she is an Assistant Clinical Professor at the Yale School of Medicine, Child Study Center. Dr. Akbar is a graduate of State University of New York at Albany, Florida Agricultural & Mechanical University, and Saint Louis University. She completed both her pre and post doctoral training at Yale Child Study Center. Active in her community, Dr. Akbar serves on the Board of Directors of The Community Foundation for Greater New Haven. A triathlete, she lives in New Haven with her husband and two children. Dr. Akbar is available for speaking, training, and consulting engagements. Please visit www.MaysaAkbar.com for more information.